Whether your passion is on the Track, riding your favourite mountain pass or GT Touring - Dunlop has the right tyre for you. The need to push the boundaries of performance is the inspiration behind every tyre Dunlop makes. From our race-winning rubber to tyres made for popular motorcycles, we strive to maximise the rider’s sense of control. For professional advice and tyre fitting service, visit your local authorised Dunlop stockist. 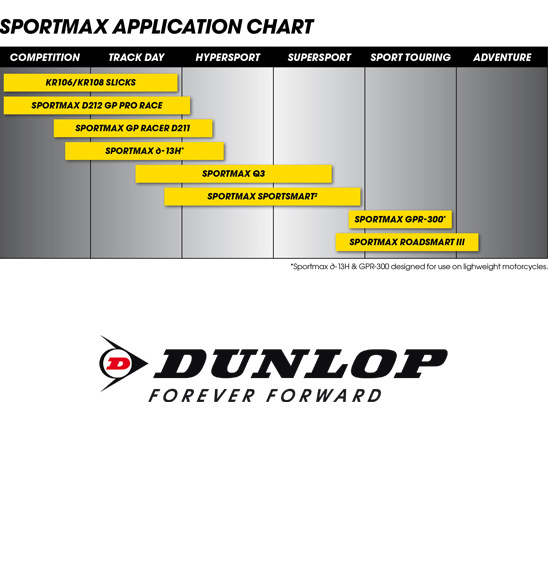 For more information on the best tyres for your bike, refer the Dunlop Fitment Guide below (under "more information").